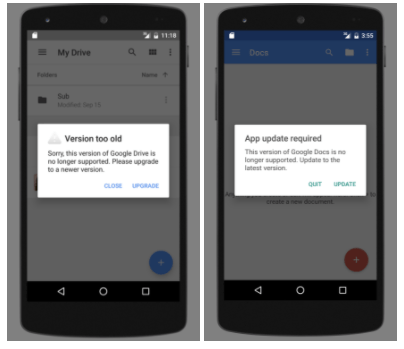 If you’re having trouble keeping up to date with Google’s Drive, Docs, Sheets, and Slides apps, you might be about to get a nasty surprise: Google is discontinuing the legacy apps in favor of its newer –and frankly much better — apps. Of course, not everyone is using the older apps simply because they don’t like the newer versions or can’t be bothered to update — for many it’s a case of not having new enough hardware to support the new apps. In any case, come April 3, the legacy Drive, Docs, Sheets, and Slides apps for both Android and iOS will shut down. So what will happen if you’re not up to date with those versions? Well, you’ll basically get a notice saying that your version of the app is too old and that you need to update to a newer version — and you won’t be able to use the app that you have. “Please note that after March 1, some users with very old versions will be forced to upgrade when they receive the prompt. If you are using any of these unsupported versions, we encourage you to download and install the latest version of that mobile application,” said Google in its blog post. Google goes on to say that this does not apply to the web versions of the apps, which are normally updated automatically.